Learn more about the certifications of Savvy Rest's natural and organic materials. Savvy Rest and our three production facilities have all been inspected and certified to the rigorous Global Organic Textile Standard (GOTS). Savvy Rest has achieved GREENGUARD GOLD Certification for our organic mattresses, pillows, and mattress toppers. GREENGUARD-Certified products must meet stringent standards for low chemical emissions into indoor air. GOLD-level certification includes additional requirements for vulnerable populations, such as children and the elderly. Respected by manufacturers and agencies worldwide, Germany's Eco Institut is an independent materials testing laboratory. Both our latex suppliers (Dunlop and Talalay) have achieved Eco Institut certification for the purity of their natural latex. 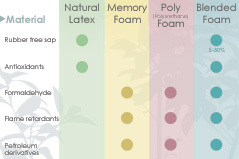 Radium Foam, our natural Talalay latex supplier, works with the Environmental Protection Encouragement Agency (EPEA) to achieve eco-efficacy with the Cradle-to-Cradle philosophy, which evaluates products according to health impact, materials re-use, renewable energy, water stewardship, and social fairness. Our natural Talalay has achieved Cradle-to-Cradle GOLD certification. Our furniture is made with sustainably-harvested and regionally-sourced maple and poplar wood certified by Appalachian Hardwood Manufacturers, Inc. We take great pride in using natural materials and value the importance of responsible sourcing and manufacturing. We strive to contribute to the well-being of our customers, our employees, and our environment. Learn more about our values. 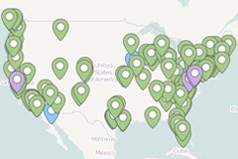 As a Green America Gold-level certified business, Savvy Rest is among "green businesses showing leadership in their industry, that embed social responsibility into the DNA of their company." Savvy Rest offsets annual estimated carbon emissions by donating to Carbonfund.org, a non-profit committed to helping businesses and individuals reduce their climate impact. After transitioning to employee ownership at the end of 2012, Savvy Rest joined the ESOP Association to benefit our employee-owners. Read more about this decision in our blog. As a certified B Corporation, Savvy Rest has pledged to uphold larger benefits consistent with its company values. Community, employee and supplier concerns, and environmental impact, are all integral to the corporate mission. Savvy Rest has maintained an excellent rating through the Better Business Bureau since 2007. Savvy Rest's mattresses were rated "Greenest" in a natural mattress review by National Geographic's Green Guide. Our mattress materials are tested extensively for purity by independent laboratories. Certifications for specific products, materials and test results are below. *Note: In the lab report, the small table at the bottom of page 3 refers to surrogate materials (not latex) used to validate equipment calibration before tests are run. This chart compares the types of foams found in mattresses.